The New York Knicks should have a top pick in this upcoming draft, simple. Almost everybody in the basketball world agrees that a player on the Duke Blue Devils roster will be the number one pick in the NBA draft. Most people see that as Zion Williamson, but if I was an NBA General Manager and has the first pick I would pick RJ Barrett. I had the chance to watch Barrett live Saturday February, 23rd against Syracuse. Zion didn’t play in that game due to his crazy sneaker injury in the previous game. Barrett took over the game, and filled the stat sheet, and crushed me, as a diehard Syracuse basketball fan, my dreams of sweeping Duke in the regular season. Barrett scored 30 points in the game, including multiple daggers that changed the outcome of the game. That game made me realize, that there is a reason Barrett was one spot higher then Zion Williamson in most recruiting rankings. But, I think Barrett’s game fits the NBA better. At the end of the day, he’‘ll be the better pro of the two. Zion can get by defenders now in college basketball, but will he be able to get by Anthony Davis and elite NBA players and perform earth shattering dunks? For all he has worked, he’s not a great shooter, and who knows if he will ever be able to improve his shooting. Zion has also had two freak injuries in the past month, a shoe malfunction, and getting poked in the eye. With how Zion plays, there could be questions about durability, and if his body will be able to take all the hits. I, personally, just think there should be more questions about if Zion’s game can translate to the NBA. Barrett has so much potential, and so much room to grow. He can score in bunches, and is an amazing defender already. Barrett could easily become one of the best wing players in the NBA in his first two year’s in the league. Both have amazing potential, and an organization would be happy with either of them. But, RJ Barrett makes more sense for the Knicks. Imagine this starting lineup next season. That’s as good as a starting lineup in the Eastern Conference. In my opinion, there is more risk picking Zion. He has a lower ceiling and a lower floor, then RJ Barrett. 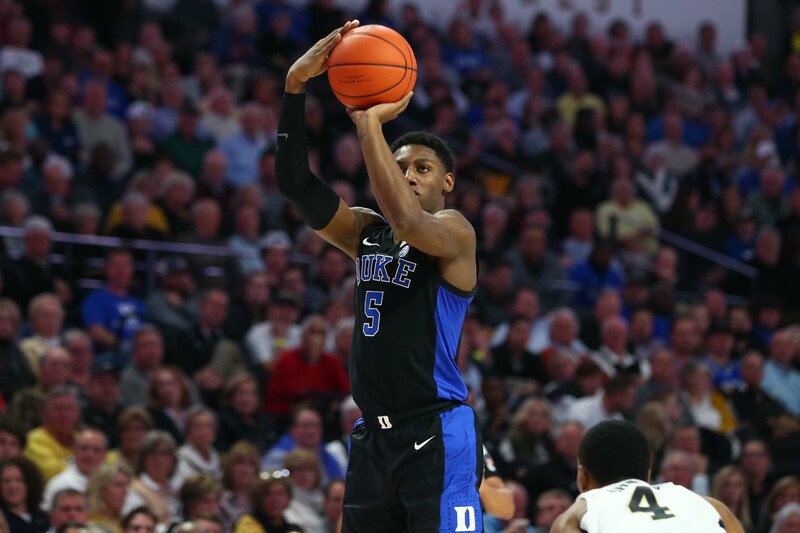 RJ Barrett is one of the best college basketball players I have ever seen. His game will translate better to the NBA then Zion Williamson.